UPDATE: Thankfully tofergregg created an IBM Wheelwriter 3/6 compatible PC Printer Option using an Arduino without even having one, so anyone can use this typewriter as a USB Printer. All you need is an Arduino Nano and some basic electronic components, which can even just be on a breadboard if you're not a soldering nut. It even allows you to use Markdown for the markup of basic bolds and underlines and such things. Unfortunately, we have yet to see something similar for the other Wheelwriter models. 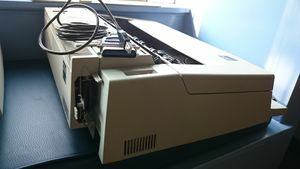 PC Printer Option - The most important option was an Parallel interface for printing from a PC, effectively transforming the Wheelwriter into a daisywheel printer. Unfortunately, it was also expensive at the time, and remains rare to this day. UPDATE: Thankfully tofergregg created an IBM Wheelwriter 3/6 compatible PC Printer Option using an Arduino without even having one. All you need is an Arduino Nano and some basic electronic components, which can even just be on a breadboard if you're not a soldering nut.